Each week, Voice of Russia hosts Red Line, a discussion about the events of the week, as seen from Moscow. This week, events in Libya, why Americans love revolution, and the legacy of Mikhail Gorbachev. Ekaterina Kudashkina: This week we will continue to follow the revolution in Libya, then we will move on to discuss a story that claims revolutions hold special attraction for Americans, and finally we will talk about Mikhail Gorbachev – the champion of glasnost and perestroika who demonstrated political change through evolution rather than revolution. For Beyond the Headlines we will look into the Libyan puzzle. The escalation of the Libyan crisis comes as a major test not only for Libyans caught in a civil war against their leader Muammar Gaddafi, but also for the world community and key international organizations. Sergei Strokan: I think test is a key word here. What I know for sure is that the situation in Libya requires consolidated international efforts. However, while the Obama administration, European Union leaders and Russia condemn violence and put pressure on the Gaddafi regime to stop fighting its own people, there is no full understanding on what should be done with this country. Ekaterina Kudashkina: What would you suggest the international community do in this situation? Sergei Strokan: Well, the talk of the day is whether the Obama administration would go for a “surgical military operation,” like establishing a no-fly-zone and bombing Gaddafi’s air-defense systems. Mira Salganik: Don’t you think that it might be a risky venture, further aggravating the conflict and causing it to spread beyond Libya’s borders? Sergei Strokan: Well, both yes and no. At any rate, Libya in its present shape has every chance to develop into “another dangerous global loophole.” This is not just a conceptual observation. First, the unrest in Libya could send shockwaves into global oil markets, further destabilizing global economy. Second, as long as Gaddafi is in power, there is no guarantee he will not use his stockpiles of chemical weapons, including 10 tons of mustard gas, against the opposition forces in a last desperate move to stop the rebellion. And no one knows what would happen to those weapons once he steps down. Third, the exodus of refugees from Libya creates a risk of humanitarian crisis in the region. Mira Salganik: It is not at all clear whether Libya would survive as an independent sovereign state at all. If a civil war involving major regions and tribes continues for a long time, Al-Qaeda and other Islamic radicals capitalize on the situation to turn the country into a new springboard for their operations. Ekaterina Kudashkina: Well, most observers say there has hardly been any Islamic element in the Libyan revolution—yet. However, right now we can only guess. The only thing that is clear, though, is that there is no chance for Gaddafi’s political survival, as he has already being largely written off both at home and abroad. The main question now is what becomes of Libya. There are a lot of former government supporters, monarchists and Islamists among those who are now fighting against Gaddafi. I believe the last thing the world needs now is Libya being turned into another Afghanistan or Somalia. Sergei Strokan: From my point of view, the Libyan crisis has already become sort of a watershed in world politics, indicating that the Cold War mentality and approaches have largely faded into history. Russian President Dmitry Medvedev’s statement on Libya, denouncing the killings of the civil population and claiming those accountable for the crimes should face international justice was the strongest ever indication that Russia has departed from its previous carefully-worded criticism. This is a very important thing. Symbolically, last Sunday all 15 UN Security Council members endorsed a resolution imposing tight sanctions on the Gaddafi regime. And finally, I was delighted this week to learn that a high-placed Kremlin source called Gaddafi a "living political corpse who has no place in the modern civilized world." Ekaterina Kudashkina: We can ask all our questions to one of the leading American experts in Middle Eastern policies, Dr. Alon Ben-Meir, professor of international relations and Middle Eastern studies at the New School and New York University. Do you see the present situation in Libya as a civil war? Alon Ben-Meir: I think you can obviously call it a civil war. It hasn’t yet reached the intensity that most civil wars eventually end up with, but it is coming. I do not believe that it is going to subside any time soon. Ekaterina Kudashkina: What are the parties in that war? We know that one party is the government but the opposition does not seem to be a formed force yet. Alon Ben-Meir: Well, if you look at what happened in Egypt, the opposition also did not have any specific leadership. They simply took to the streets, to Tahrir Square, and demanded changes in the government and the removal of Mubarak. Popular uprising happens when the population gets to the point where it has only despair and therefore, the successes in Tunisia and Egypt have given hope to the Libyan people that a similar revolt, although disorganized, will succeed as well. Gaddafi’s era is over. The question only remains as to when it will happen – is it going to take another week or two or a month or two. He is going to be removed one way or another. Ekaterina Kudashkina: Do you think that this process will require some international efforts? Alon Ben-Meir: International efforts are already in place—the U.S. took steps to freeze Gaddafi’s assets; he cannot export oil. I would not suggest that military force will necessarily be used, but when the U.S. prepares this kind of force, it will be enough to cause Gaddafi and his military to think twice about what they are going to do next. They have gone too far, and as a result, Libya has been ousted from the Arab League. Opposed to by the three major entities—the EU, the U.S. and the Arab states, Gaddafi doesn’t have many options left. Ekaterina Kudashkina: If we talk about the reaction of the international community and the pressure it is exerting on the Libyan government, such pressure can yield different results. In some cases, those under pressure become more stubborn. Alon Ben-Meir: That’s true. This is exactly why the United States and the EU do not—and should not—intervene directly if they can help it. Ideally, if there is going to be any military intervention, it should come from the Arab states themselves. I don’t rule out such a possibility at all, because the Arab states are also undergoing a certain level of turmoil. They want to demonstrate that they are not going to accept another member state willing to slaughter its people. This will serve the Arab long-term goal if they demonstrate solidarity against Gaddafi and do something about it. The Arab League is about to meet in the next 10 days or so in Baghdad and it will have to pass some kind of a tough resolution with some action against Libya. So from my perspective, Gaddafi will no longer be able to maneuver much. Half of his military has defected as have many Libyan missions and diplomats around the globe. He neither has any kind of diplomatic court to lean upon, nor military police to use effectively for a long period of time. This is why I think his time has come. He will try to cling to power as long as he can, and he has sons who even have a greater interest in staying in power. Their days are numbered too and the sooner they find refuge at some place, the better it is going to be for them. Ekaterina Kudashkina: Some analysts say there is a high risk of Islamic fundamentalist elements filling in the vacuum that will be created after the Gaddafi clan leaves the country or loses power. Do you agree with that? Alon Ben-Meir: Well, I don’t think that Libya is a good candidate to become an Islamic state because when you look at various constituencies representing the public, you see that it is a tribal society. There are many tribes. The tribes can hardly ever agree with each other about anything. There is an Islamic movement there, but it is not entrenched and strong enough to be able to dominate. Moreover, if you look at the revolution in the streets, the people don’t seem to be waging this resistance in the name of God. The resistance and efforts they make are directed against Gaddafi himself. I feel that Libya will probably go through a period of extreme instability before some kind of government is formed. The role of the military remains a big question, because the military itself is now divided. I might predict even a period of some kind of anarchy for a while before the opposition regroups and decides on the course it will take to stabilize the region. Ekaterina Kudashkina: Speaking of revolutions – I have read a most extraordinary – and emotional – article about revolutions published by Newsweek magazine that I would like to discuss in our second segment, Between the Lines. This article is entitled ‘Un-American Revolutions’ and was written by Niall Ferguson, an historian, political analyst and former advisor to U.S. Senator John McCain. What Ferguson wanted to look into is why Americans hail what he describes as the “Arab revolutionary wave,” provided that most rebellions end in carnage and tyranny? He suggests that first, the U.S. should have tried to repeat the successes of the pre-1989 period when it practiced what it preached in Central and Eastern Europe by actively supporting those individuals and movements who aspired to replace the communist puppet regimes with democracies. This was one of the reasons that, when the crisis of the Soviet empire came in 1989, there were genuine democrats ready and waiting to step in. Secondly, according to Ferguson, the U.S. should have been ready to exploit the divisions within the Islamist movement. Mira Salganik: Well, now that we all know that U.S. has no Middle East Strategy should we wait for the doomsday scenario Ferguson has described? Ekaterina Kudashkina: Not exactly, Mira. The Obama administration is currently carving out a new U.S. strategy for the region which it’s going to present in the coming weeks. Otherwise, like Ferguson says, the Middle East revolutions could produce new enemies as formidable as Napoleon’s France, Mao’s China, or Stalin’s Soviet Union. Now our guest speaker is Yury Rogulev, director of the Franklin Roosevelt Center for U.S. Studies at Moscow State University. Mr. Rogulev, do you agree that Americans love revolutions? Yury Rogulev: This is very questionable. If we speak about American history and its internal politics above all, the major tradition was a moderate reform. It was probably the most radical approach that Americans could follow. Even under such circumstances, some of the reforms, let’s say, in the 1930s were referred to as socialism or fascism or creeping socialism. This shows that any kind of radicalism has not been accepted in the U.S. Certainly, speaking about American foreign policy in the 20th century, we can see that this tradition has been followed by the U.S. in foreign policy as well. Ekaterina Kudashkina: Mr. Ferguson’s article maintains that Americans tend to welcome revolutions that occur outside of their country. Do you think this is the case? Yury Rogulev: If Ferguson’s article had been published, let’s say, three months ago, I would have agreed with the author, but the events in Egypt and other countries came as a shock for the Americans. It was difficult to speak about any kind of support for those movements, because those movements did not exist in those countries. It was so sudden and unexpected and not a matter of strategy for the American governments. The strategy was quite the opposite. Mubarak’s regime in Egypt, for instance, had been a close ally of the U.S. for many-many years. The main strategy was to support this regime. Ekaterina Kudashkina: If we start to discuss the situation in the Middle East, it is interesting that the developments in Tunisia and Egypt - at least to my mind - could hardly be described as a revolution proper. But what we witness in Libya now is not even a revolution - it is a civil war. So, how do you think the situation is going to develop from now on, as we have just witnessed the developments are very uneven in that region. Yemen, I think, is balancing on the verge of a revolution. First Tunisia, then Egypt, Bahrain - I don’t think Bahrain is in such a serious condition - and now Libya. How do you see the further development of the situation? Yury Rogulev: First of all, I am not a specialist in the Middle East issues. But what I can see as a historian and a political analyst is that we are at the beginning of a serious change in many countries of the Middle East and North Africa. We cannot say right now what the changes and the outcome will be; whether this would be a real political revolution or not. We even cannot say what will happen in Egypt, what kind of regime will emerge after all these events, what will be the role of the masses. We don’t see a united opposition in these countries; we don’t see any strong political leaders of these movements. There are many other serious questions concerning the goals. We see the uprising, discontent, the division of these societies and sharp conflicts. But what will be the outcome still remains to be seen. 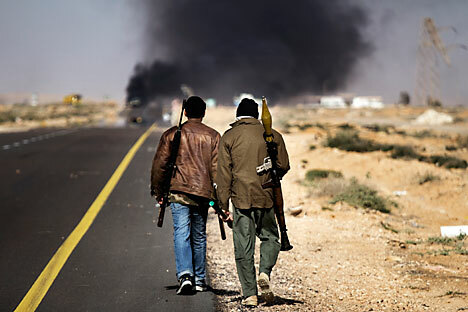 Ekaterina Kudashkina: If this full-scale civil war breaks out in Libya and if the international community intervenes, will that somehow calm the situation in the region or perhaps the opposite? Yury Rogulev: I believe that the reaction will be the opposite. The situation is very complicated. We know that Libya is divided and that there is a very strong tribal influence. Intervening in that kind of situation will be very, very dangerous. It is like Afghanistan and Iraq. We already have experience of dealing with such problems for many years - the Soviet Union, the United States, and also Great Britain. We understand that amid such a division in the country and the tribal influence, it will be very hard for strangers to intervene. From my point of view, of key importance is the matter of coordination of efforts of many other countries in the world and the United Nations. It is not just an intervention itself - it is coordination and joint positions of the world political powers which may help to solve the situation without intervening into these events by means of negotiations and dialogue between different forces. Sergei Strokan: To sum it up, there are different ways to deal with threats like those we see in the Middle East today. There are revolutions and evolutions, an evolutionary way, to be more precise. In our next chapter we’re going to talk about the man who decided that evolution might turn the Soviet Union into democratic Russia. Ekaterina Kudashkina: So, now we are turning to Red Line’s concluding heading Man in the News. This week it is Mikhail Gorbachev – the last Soviet leader who’s celebrating his 80th birthday this week. Mira Salganik: Mikhail Gorbachev is a unique figure – whatever one’s assessment of his career might be. Vested with absolute power over the Soviet Union, in that time unquestionably one of the world’s two superpowers, Gorbachev launched a new policy of glasnost (openness) and perestroika (restructuring) that changed the global power balance. It led to the end of the Cold War. Ekaterina Kudashkina: However, he is admired by some and hated by others. Sergei Strokan: After his resignation, Mikhail Gorbachev has kept a low profile, with rare public appearances in Russia although as a speaker he is much in demand internationally. The Gorbachev Foundation in Moscow, founded in 1992, is a kind of a think-tank not much in the public eye. Mira Salganik: Francois Mitterrand has given a good description of Gorbachev’s endeavor to reform the Soviet system, picturing him as a man who wanted to paint over an ugly stain on a wall. While doing that, he discovered a crumbling brick under it and pulled it out, which led to collapse of the wall and finally to collapse of the house. Sergei Strokan: This is different to Yeltsin, who is considered the man who crushed the wall. Ekaterina Kudashkina: Vladimir Putin described the Soviet Union's breakup as “the greatest geopolitical catastrophe” of the 20th century. There is no doubt that this is precisely how a large number of people in Russia feel. Sergei Strokan: But how much longer could the Soviet Union hold out given the enormity of problems mainly caused by rigidity of its political structure and inefficiency of the heavily centralized command economy? Gorbachev initiated change, but he believed not in revolutions, but in evolution. Mira Salganik: You cannot blame Gorbachev for the collapse of the Soviet Union – he was opposing it to the very last. I’d say that he played a revolutionary role in international politics, but domestically he acted as a reformist. Gorbachev did believe that the system could be reformed, but he miscalculated both the resistance of the system and the inertia of masses, kept in inactivity for almost three-quarters of a century. I think we have to agree on one thing at least: Gorbachev has opened this country. I don’t mean for the rest of the world – he opened it for us here, by lifting the ban on our own history, our art and literature, hitherto absurdly censored by what went under the name of Communist ideology. I am sure the time will come when Russia will pay tribute to what Gorbachev has done. Ekaterina Kudashkina: Now we can also talk to Alexei Arbatov, director of the Center for International Security Studies in Moscow. He has joined us to share his vision on Mr. Gorbachev and his time in power. Ekaterina Kudashkina: So much time has lapsed since Gorbachev left his position as the head of the country. How would you assess his impact on the international situation when he was at the helm of the Soviet Union? Alexei Arbatov: Very few people can be compared to him by the degree to which they affected international relations, and what is more, even fewer, could compete with him in the positive effect they produced on international relations; there were some people who had bigger effects, but in a very negative sense, like Stalin, for instance; Khrushchev had a very mixed impact, that was both good and bad, just like his domestic politics. As for Gorbachev, his impact on international relations was comprehensively very positive. Ekaterina Kudashkina: In one of his recent interviews I recall him saying that when he first met with President [Ronald] Reagan, they spent the first day of their talks in the atmosphere of strong mutual distrust. But as an expert in international relations, could you recall how the international community started to accept Gorbachev, and how the attitude was changing, or perhaps initially it was very favorable? Alexei Arbatov: I was deeply involved in this debate from the very beginning of his time in office as Secretary General. I would say that for the first couple of years, the majority of the Western public opinion, and professional community, and political elite didn’t trust him, they didn’t believe that he was for real; they thought that everything he did was saying good words and that nothing would come out of it. But then when things started to change, and when his foreign policy started to produce serious changes, this attitude also changed, and he very quickly became enormously popular in the West and in the world at large—in the West, because of his ending the Cold War; in the world at large, because he ended the arms race and called for a nuclear-free world. Ekaterina Kudashkina: But how would you assess Mr Gorbachev’s international role now? Alexei Arbatov: His international role now is not that of a policymaker, and not that of an expert on international relations, but that of a recognized moral leader, who has proved that things could be changed, that things could happen, and his role, in my assessment, is extremely positive. I think he is the most respected and widely recognized moral authority in the world. He has certainly gained recognition as a person who ended Cold War, who ended the arms race, liberated the people of the Eastern Europe, and gave them freedom, and did away with the split of the world and Europe into two hostile camps.